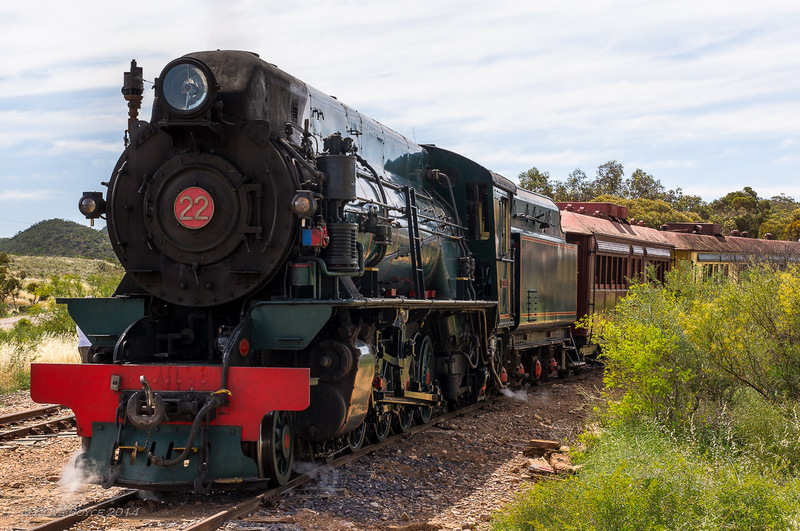 This third post starts at Woolshed Flat and what attracted me to come up to see the Pichi Richi Railway on this particular weekend is revealed – the rare opportunity to see a steam double-headed train. Waiting at Woolshed Flat for the Ghan Express to arrive was the Pichi Richi Explorer, a second heritage steam service that had come up to Woolshed Flat from the other end of the line at Quorn. This entry was posted in Australia, Machinery, Places to Visit, Regional South Australia, Trains and tagged Afghan Express, Heritage Railway, NM25, Photography, Pichi Richi, Pichi Richi Explorer, places to visit, Quorn, Regional South Australia, South Australian Railways, The Ghan, tourist attraction, W22, Woolshed Flat on February 24, 2015 by aussiesouthlander.